New Delhi: (18/03/2019) A new development in the politics of Bihar has been postponed. The announcement of candidates of Lok Sabha Janshakti Party is scheduled for today but the party has postponed following the death of Goa CM Manohar Parikar. 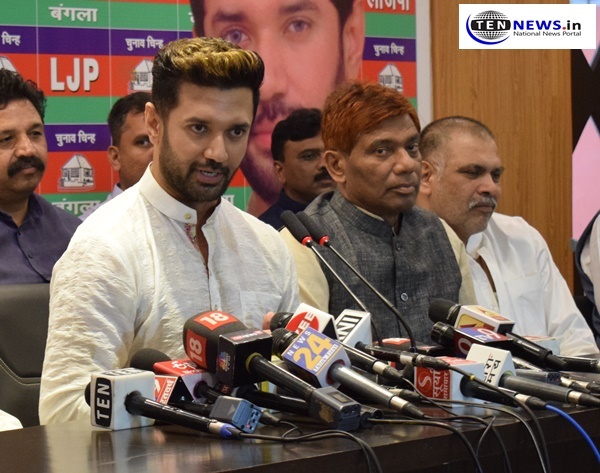 While addressing a press conference, Chirag Paswan confirmed that Lok Jan Shakti Party will conduct election on six seats and one seat is reserved for the party in Rajya Sabha. The leader said that amicably the process of selection of seats is completed through meetings, attended by the leaders of all the parties in NDA. Janta Dal United and Bhartiya Janta Party will field their candidates on 17-17 seats each while six seats are for the Lok Jan Shakti Party. The seats on which Lok Janshakti Party will field their candidates are Samstipur , Jamai, Vaishali, Hajipur, Agadiya and Navada. Paswan also stated that today a meeting of party’s parliamentary board was conducted and we have discussed about the name of candidates. Today, a sad news was came that our beloved CM of Goa Manohar Parikar was passed away that’s why we won’t announce the name of our candidates. The leader also confirmed that in a day or two the names of the candidates will be announced, he also claimed that Lok Janshakti Party will be winning on all the six seats and will score around 37 seats in the state out of 40.